We all are familiar with the website Google.com. But the truth is that, many of common internet users (also Google users because for common, Internet = Google) are not beware that Google is a company and they makes revenue for your searches. Yeah Google is a multinational company founded by Larry Page and Sergbrin who was studied in University of California. The main revenue source of Google is advertising and 95% of Google services are free of cost for their customers. Do you know How Google Earn Money? It's simple. When Ever you searches a word or sentence (say Keyword) on Google search, Google will display results with advertisements relevant to your searched word. 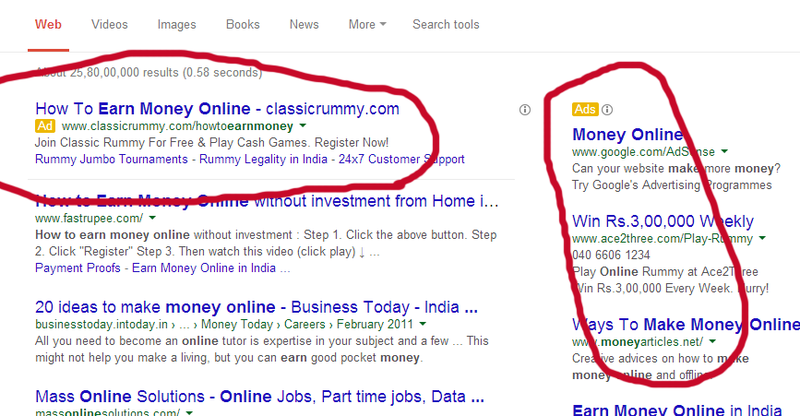 For example, I have searched for, "Earn Money Online" and got results with relevant ads (Marked with red circles). If you click on such results, Google will get revenue and Advertiser of that ad is not need to pay for displaying ads Just Pay Per Click. Google Adsense Google is not only available in Google websites. There are lacks of websites running and making revenue by using Google Ad services and you can also use your website or blog to make money online. The service which allows publishers to earn revenue is Google Adsense. Publishers will get advertisements from Google and if any of visitor clicks on ads, Google will pay commission for the publisher on CPC (Cost Per Click) basis.